I’m now back in the carving shed after delivering work to Sculpt at Kew. 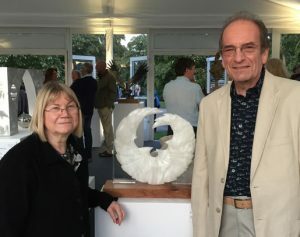 Here’s a photo of my husband Jim and myself at the opening reception, in the retail gallery after visiting part of the sculpture trail – ‘Born on the West Wind’ between us. There are 75 fabulous sculptures, sensitively sited around the gardens, together with additional smaller works inside the gallery, so it is a large event. Whilst we were there, visitors seemed genuinely engaged and delighted to see the works in a beautiful setting. It’s been a real pleasure to be involved with such a high quality exhibition and it is proving to be a great experience. A little sad though to say goodbye to ‘Nebula’, which sold at Kew last weekend and features on my home page. It was a particular favourite of mine – but it seems to be going to a new appreciative home. To remind you, Sculpt at Kew runs until Sunday 15th September. Thanks to Jelena of Handmade in Britain for taking a rare photograph of the two of us together!